They're everywhere right now and they're relatively inexpensive, especially if you grow them yourself. They're not just for Halloween anymore, they're a fall favorite and if you don't carve it and protect it from frost, it will last well into the chill of November. Plus, you can use them inside and outside! Try placing them on candle holders, in clear vases or adorning shelves. 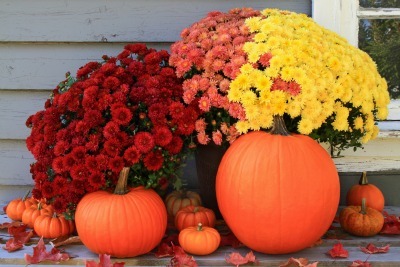 Outside, they make a great pairing with fall plants for a colorful porch display, like below. Sticking with produce, have you ever considered using apples as decor? Think about it, decorate with all sorts of reds, yellows and everywhere in between and then use them to eat or bake with, Genius! And they're really inexpensive in the fall, another plus. Try putting them on shelves, in baskets or bowls as centerpieces. Is there anyone who doesn't have an abundance of leaves right now? It seems they fall later every year but that just means we get to enjoy the colors longer, right? There are a lot of craft projects that can be done with leaves but how about just cutting off a branch and sticking it in a vase with some water. Yes, it will have to be switched out frequently but can make fun dinner party decor on the short term side of design. This has become very popular in recent years to add a bit of rustic to existing decor. There are way too many uses for burlap to try and list them all but some of my favorites would be table runners, bows, candle/vase wraps, and banners. It's exceptionally easy to work with and can be reused again and again. You can find it in ribbon like widths up to fabric size yardage. I love the concept of changing out pillows seasonally. It's such an easy way to rotate what you have but always feel like you have something new! If you aren't blessed with a large area to store seasons of pillows, consider buying covers instead and they'll lay flat and out of the way. 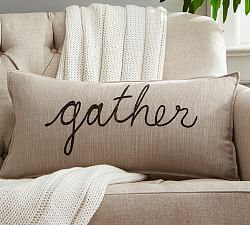 I love the simplicity of this pillow from Pottery Barn. This option, in my opinion, is perhaps the easiest and quickest, if you consider yourself decorating impaired. It's especially easy if you have an existing gallery wall but you can use something like this anywhere in your home. You can typically find low cost printables all over pinterest (or check out the growing printables collection I've designed). Just download, print and frame. How easy, and what a great way to display your own holiday style while giving it a designers edge. I'm a huge fan of using what you already have whether it be from inside or out. Now most people don't have access to make something like this without buying some supplies but I think it makes a nice piece for colder weather without being an evergreen. I love how in the one below, the wreath is jazzed up with some twigs for a fuller, more seasonal look. I know what you're thinking, this sounds too easy. Well, it is. You can pick ones that will match what's going on your tree, or pick something totally different, either way, they'll look awesome! And though I love using a wire basket for visibility, any kind will do. Or even a tall hurricane vase, if you have one large enough. I seriously love how easy this is. I'm not against using colored lights, especially if you have kids. They add a certain bit of fun to your tree or garland. But, white lights have a seemingly simple, upscale look. They give a clean sparkle anywhere you put them. I like to use them on my tree and fireplace mantel but the great thing is lights can go anywhere. Use a lot or only a strand, it's up to you! Paired with white, silver or gold ornaments, they can make any tree look sophisticated. I probably don't even need to explain why this is on my list if you see the picture below. Holly is known for it's waxy, bright green leaves, and cherry red berries. A delightful coloring paired together that makes any wreath, garland or arrangement visually pop. It's also another option that isn't evergreen. Whether you choose to use the real deal, or buy faux options, adding a few sprigs here and there can really add Christmas cheer, without even trying. No, I don't mean the ones going under the tree. Find some empty boxes of varying sizes and wrap them up with cute paper and bows. Consider buying brown or white paper to keep things classy. I like using twine or neutral ribbon and I give the a-ok to using glitter, if you choose. If you don't want to do this every year, create boxes out of wood cubes and paint and reuse them. They're a great addition to mantels or flanking the sides of stairs. Or just arrange them in a stack to bring that festive spirit into any room. 6 - Pine cones and Sticks. I realize that neither of these things sounds like something you'd decorate with, typically they're something we pick up and toss aside. However, with a little imagination and effort, they can be quite stunning. And all decorating takes is a little something here, another piece there, and suddenly it's all pulled together. When I picture how pine cones and sticks will look for your holiday trimmings, they're white, frosted or glittered and used to accent, not be the main piece. 7 - Art Prints, again. I couldn't help but add this in again. It really is such an easy way to add a touch of holiday to your walls or existing frames. And if you're thinking, I don't have a good printer, it's really quite inexpensive to print a color copy at your local Kinkos, etc. I hope a few of these ideas make their way into your home this Holiday season, I'd love to see what you do with them! Look for my next post later this month, I will be sharing on the upcoming trends for 2016!